Like most good mystery stories, it started on a train. Beyond the ghostly reflections of passenger faces on plexiglass, glimpses of whitewashed Grecian buildings alternated with graffiti-clad concrete flashing past the train windows. But I hadn’t been paying much attention to all that–not when my hands held an open autobiography. “——–,” spoke a slightly cracked female voice, the Greek words rising above the surrounding clatter of train rails to arrest my concentration. A woman’s face looked back, well-worn laugh lines meandering like rivulets towards the white hair which curled under her hat. “——–,” she repeated, and pointed to the book I held. I turned it just enough so we both could see the word “God” on the cover. “It’s about an Australian who studied Hinduism under a guru, but became a Christian,” I said, not knowing whether the explanation would transcend our language difference. She bobbed her head, still smiling. I smiled too, and returned to reading. Suddenly, a patch of laminated burgundy appeared above the white pages. “Oh!” I exclaimed, picking up the card which had landed on my book. For a second, I examined the image it bore. Judging by the reverently closed eyes, the halo hovering above her head, and the rosary which dripped from her right hand, I supposed she must have been a saint. From what little I’d learned about the importance of icons, art and emblems in the Orthodox Church, I could only imagine what the image’s significance might be. I turned the card over, uncovering a slurry of cryptic Grecian script nestled amidst a floral border. The passenger’s eyes disappeared somewhere inside her crinkly grin as she placed a weathered hand on her heart. I nodded a final thanks, tucked the card into the back of my book, and continued gazing at the page. There’s no telling exactly what that card is, but hey–I needed a bookmark. The card traveled with me the rest of the day, riding in my laptop bag around the Acropolis, through markets, and along sloping, unmarked streets. 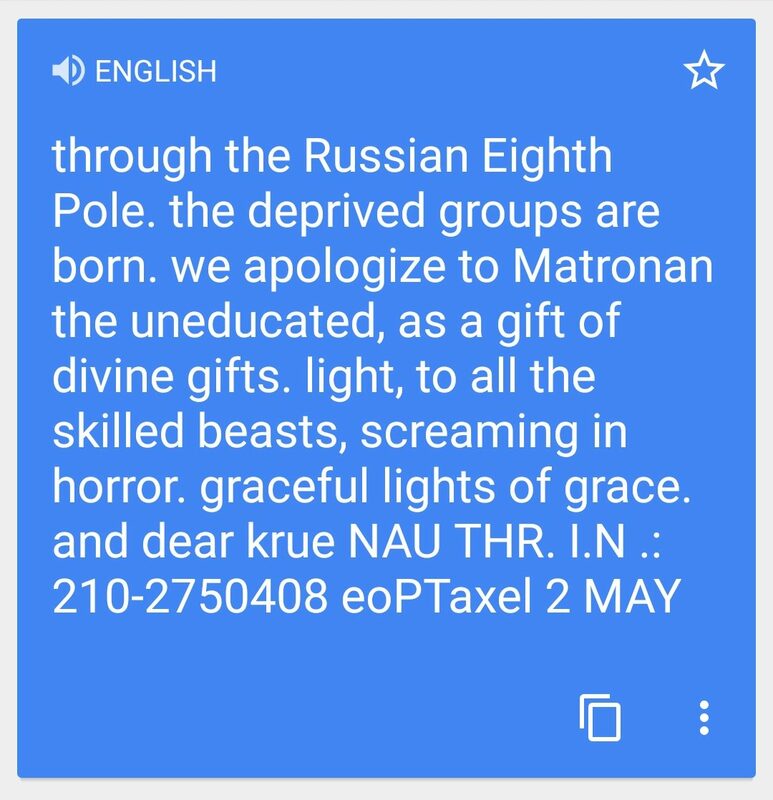 Only much later did I revisit that unlikely bookmark and the mystery of its meaning, when I typed “how to translate text from photos” into my search engine. 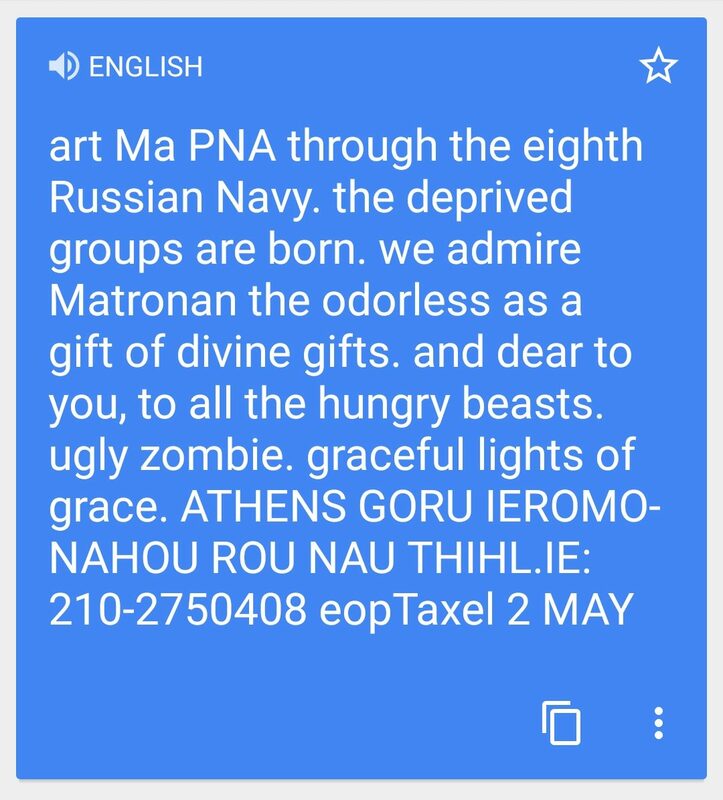 I aligned the card with my phone lens and hit the camera button, my eyes fastened on the blue line which began slowly scanning the Greek calligraphy. After a moment, little blue boxes lit up around most–but not all–of the words. I hit the “translate” button, staring at the screen like a 20th-century detective watching a piece of crucial film evidence develop in a darkroom. If this were a black-and-white movie, the detective might wait with bated breath as a blurry image appeared, clutch the photograph before the moisture even dried and–with hawklike eyes riveted on the evidence–summon a sidekick to ring the police. 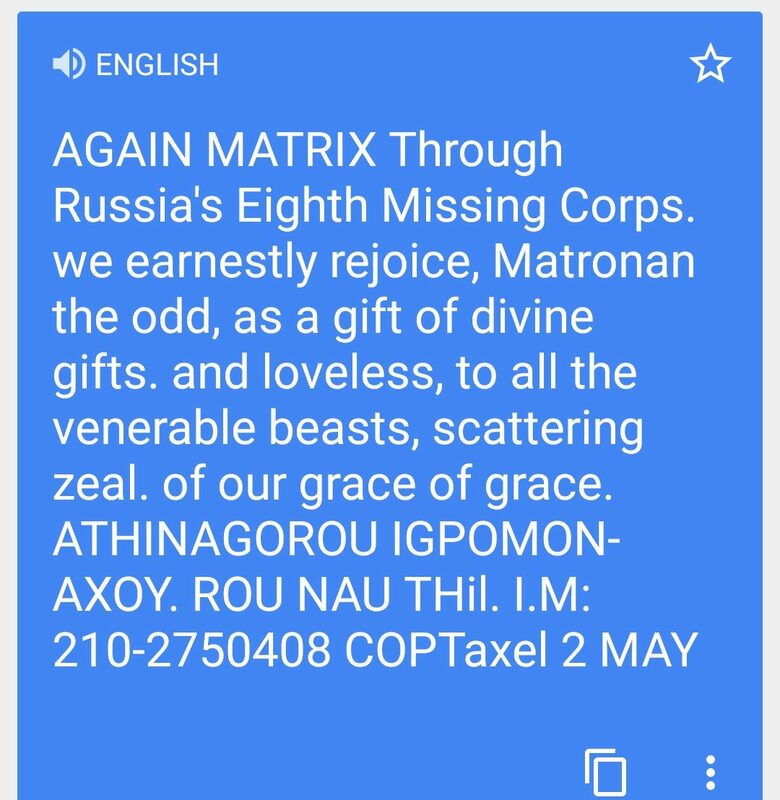 In real life, however, I merely waited for a blue translation screen to appear, read the English text, read it again, and then laughed out loud. Maybe I’m just closed-minded, but “Matronan the Odd” didn’t strike me as that saintly of a title. And of all the phrases the grinning grandmother could have presented me as a token of concern for my soul, “ugly zombie” is the last thing I’d expected. Never mind extending lovelessness to all the mighty bulls, wherever they were. Surely, I reasoned, there must have been an error in translation. Clearly, my poor smartphone had no real grasp of the matter at hand. But perhaps if I attempted the translation enough times to find a common denominator, I could piece together a clearer idea of what in the world the stranger on the train had given me. Following the only lead I had, I searched online for the name Matronan. Unfortunately, nothing remotely related to Orthodoxy surfaced. I confess I even searched for Matronan the Odd, but the internet had never heard of the unlikely saint either. I didn’t even try Matronan the Odorless. My friend from the local Bible school! Of course, she could decode the message. Why hadn’t I thought of that earlier? My curiosity piquing, I texted her the image. “It is an invitation to an Orthodox Church celebration of the Saint Matrona,” she soon replied. Well then. At least that much of the mystery had been solved. But who was Saint Matrona? A little research explained that much. Over a hundred years ago, it turns out, there lived a desperately poor peasant family in Sebino, Russia. Their fourth child, named after fifth-century Saint Matrona of Constantinople, brought her family a constant supply of surprises. For one thing, she was born without eyes. That explains why the woman’s eyes are closed in the picture, I realized. No thanks to my Translate app. Patricia, I have never laughed so hard! Excellent story, and I love the history too. Welcome back to Canada! Haha thank you! I’m glad you had fun with it. It’s great to be back, despite the three feet of snow which greeted me upon arrival.